There are a lot of terms we use on this site, our bulletin boards, and on the trails. Thanks to Superlift, we are able to put this glossary together. These definitions cover most of the "non-obvious" technical terms used in our catalog and on our website. The meaning of words like "bump steer" and "steering wheel kick" can vary, depending on the user, since they are industry and enthusiast terms, not official Society of Automotive Engineers terms. These are our definitions and we are sticking to them! Anti-sway bar links - The anti-sway bar assembly consists of two primary parts: a "U-shaped tubular body that spans from one side of the vehicle to the other, and two links (one per side) that connect the body to an anchor point on the axle or control arm. Generally, the bar body is relocated or longer links are used to compensate for a lift system. Anti-sway bar pre-load - As lift height increases the sway bar body pivots and begins to pre-load. This pre-load puts extra stress on the links and reduces suspension flexibility. Proper bar geometry is restored by relocating the body or by using longer links. Articulation is how well each axle, or each wheel, will travel and "twist-up" when traversing an extremely off-camber obstacle. When off-roading, you want as much suspension articulation as possible to keep the tires on the ground and getting traction. As suspension manufacturers, we search for the right balance of off-road articulation and on-road stability. Bump steer can be caused by a number of alignment related issues. This is when a vehicle darts or wanders, especially when operated on a less than ideal driving surface. In other words, it takes a concentrated effort to keep the vehicle in a straight line. Body roll is most noticeable when turning at speed. One side of the suspension compresses and the opposite side lifts. 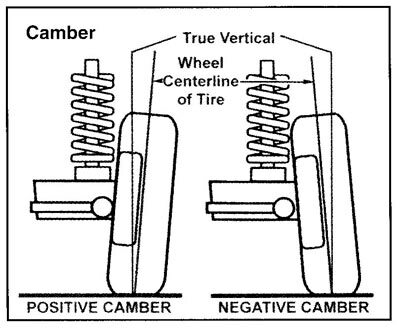 Camber angle - A steering geometry term; camber is impacted the greatest when lifting a Ford with TTB suspension. 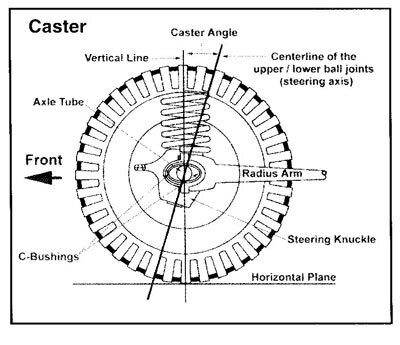 Caster Angle - A steering geometry term; caster is impacted the greatest when lifting a vehicle that has radius arms. Centerlink - A piece of steering linkage that connects the pitman and idler arms, commonly found on IFS vehicles that have upper and lower control arms. A tie rod connects to each end of the centerlink. On most lifted trucks, the factory centerlink is either relocated or replaced by a "dropped" centerlink. CNC - Acronym for "Computerized Numerical Control." Term describes a type of control system used on a piece of manufacturing equipment. CNC machines offer unsurpassed accuracy and repeatability. Coilover shocks - Also called "struts," coilovers incorporate a shock absorber housed inside of a coil spring. Common coilover equipped vehicles are the 2004 and newer F-150 and the Toyota Tacoma / Tundra trucks. Coilovers are also used on the Superlift / Black Diamond XCL and X2 series Jeep lifts. Compression travel - A measurement of the amount the suspension will compress before it bottoms-out against its travel-stops. This travel-stop is also called a "bump-stop" and "jounce-stop." Control arms - Also called "A-arms" because of their shape, are found on all IFS suspensions listed in this catalog except for the Ford TTB. There is one upper and one lower arm on each side. They have a balljoint on the outboard end, and connect to the frame on the inboard end. CSS - Acronym for Centerlink Stabilizing System. A dropped centerlink tends to pivot fore and aft excessively when turning force is applied. The CSS uses one or two links to tie the centerlink to a crossmember and prevent this excessive movement. Curb weight - How much the vehicle weighs when loaded with normal compliment of passengers, fuel, gear, etc. CV axle - Acronym for Constant Velocity axle. With a control arm style IFS, they are the rubber or plastic booted axle shaft assemblies (one per side) that bolt to the differential housing flange on the inboard end, and mate to the hub / knuckle on the outboard end. DOM - Acronym for Drawn Over Mandrel. The term specifies a certain type of tubular steel that has exceptional strength, forming and welding characteristics. DOT - Acronym for (Federal) Department Of Transportation. Drag link - A piece of steering linkage that connects to a pitman arm on the upper end, and a tie rod or knuckle on the lower end. On lifted vehicles, sometimes an Original Equipment (OE) drag link is replaced by a "dropped" drag link to reduce link angle. Driveability - The sum of the vehicle's driving traits and mannerisms. Handling, steering traits and ride quality are the major categories that influence driveability. The question is how will a particular suspension alteration impact driveability? Driveshaft angle - The angle of the driveshaft in relation to the pinion yoke (at the differential) or the output yoke (at the transfer case). Driveline vibration, bind-free driveshaft operation and shaft length are influenced by driveshaft angle. 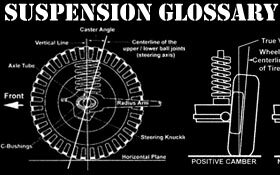 Extension travel - A measurement of the amount the suspension will extend before it tops-out against its travel- stops. Four-link suspension - This suspension type uses two upper and two lower link-arms to connect the solid axle (front or rear) to the frame. The Jeep TJ has a common 4-link system. Frame Integrated Technology - F.I.T. was the most fitting (and coolest) acronym we could think of to describe our premium method of lifting certain IFS equipped vehicles. The F.I.T. design concept utilizes extremely close-toleranced components that fasten together in a unique way to form an unbelievably strong subframe assembly. GVWR - Acronym for Gross Vehicle Weight Rating. This information is provided by the vehicle manufacturer and is located on a tag generally found on the driver side door jamb. It tells you how much total weight, including occupants, fuel, bed load, etc., the vehicle is rated to carry. Idler arm - An idler arm is found on IFS vehicles that have a centerlink. The idler arm supports one end of the centerlink while the pitman arm supports the other. IFS - Acronym for Independent Front Suspension. With this type of suspension, the wheels travel independently of each other. The IFS covered in this catalog are either control arm types or Ford TTB. Knuckle - A casting at the outboard ends of the axles that the spindle / hub / wheel assembly connects to. Replacement knuckles are used on lifted IFS vehicles when the lower control arms are lowered, but the upper control arms are not. Military Wrap - Featured in some leaf spring designs, the second leaf plate wraps around the spring eye (called the main leaf) to form a double-wrap. This design element transmits less stress to the main leaf during extreme articulation. It also lessens the odds of spring separation in case of main leaf failure, and provides greater strength, support, and durability as a whole. Nodular Iron - What Superlift knuckles are made from. The material's composition does not mean squat to 99.99% of Earth's population; just trust us when we say that it is great stuff. OEM (or OE) - Acronym for Original Equipment Manufacturer. In this catalog an OEM is the actual vehicle manufacturer like Ford, GM, etc. Pitman arm - This steering component splines onto the steering sector output shaft. The opposite end connects to a drag link or centerlink, depending on steering system design. With a dropped pitman arm, the drag link attachment point is moved down to reduce link angle. Pre-set coil springs - Pre-setting involves fully compressing the coil spring (so that the coil wraps are actually touching each other) in the manufacturing process. This reduces the amount of coil sag and extends coil service life. Progressive rate coils - Most coil springs have rates that are constant; if it takes 400 pounds to compress the spring the first one inch, another 400 pounds will compress it the second inch, and so on. With a progressive rate coil, the initial couple of inches of compression requires less spring rate than the remainder of compression. This improves your "Sunday drive" ride quality, yet rate increases when you're in "Banzai mode." With progressive rate coils the first few coil wraps are more closely spaced than the remaining coils, or the entire spring is slightly conical (cone-like) in shape. Radius arm - The arms (one per side) run basically parallel with the frame rails. They locate the front axle housing and prevent fore and aft axle movement. Common vehicles factory equipped with radius arms are 1966-79 Fords with coil spring / solid axle suspension, 1980-96 Fords with coil spring TTB, and 2005 and newer Super Dutys. Caster angle must be addressed when lifting vehicles with radius arms. Rock Fink - Superlift's "spokes rodent" was a collaborative effort of Superlift President Bret Lovett and Ed "Big Daddy" Roth. It was Bret's idea and Ed's artistic genius that brought Rock Fink, first cousin to Rat Fink, to life. Big Daddy, a legend in the automotive industry, died on April 4, 2001. Rock Fink was one of his latest and greatest, creations. Rock Fink apparel and prints are available. Roll and yaw - The problem exists on lifted vehicles that have incorrect track bar length and / or severe track bar angle. When lifted, the track bar needs to be lengthened or binding occurs as the suspension travels... if unaddressed, the frame and axle housing will continuously "tug" against each other. This is most noticeable when the vehicle is being driven in a straight line, going through highway dips at speed. The sensation compares to the side-to-side oscillations of a boat. A certain amount of "steering wheel kick" normally accompanies roll and yaw. Solid axle - A one-piece axle housing design that has rigid axle tubes all the way out to the knuckles. Good examples of vehicles with solid front axles are 1966-79 Fords and 1969-87 GM trucks. Spring rate - A measurement of force (in pounds) required to compress a spring a given distance (in inches). Be careful when comparing rates since all manufacturers do not use the same measuring procedures. Steering arm - This forged steel component bolts to the front axle knuckle. Its opposite end attaches to the drag link. A raised steering arm is taller to reduce drag link angle. Steering wheel kick - This malady is most noticeable when you are driving in a straight line and the suspension compresses, like when going through a highway dip at speed. The steering wheel will move slightly, but the vehicle continues to track straight ahead. If the vehicle has a track bar, the problem is related to incorrect track bar length (too short) and / or incorrect phasing. "Incorrect phasing" exists when the track bar arc-of-movement is not in phase with the drag link arc-of-movement. Incorrect phasing can result when a dropped pitman arm is used, but the track bar is not lowered. A certain amount of phasing miss-match is acceptable, but at some point "kick" will occur. Also, normally a slight amount of steering wheel kick is noticeable on lifted leaf sprung / solid axle GM vehicles equipped with a raised steering arm. Stud bind - When a tapered stud, normally a tie rod or track bar end, over-extends its pivot capability. This is a byproduct of excessive operating angles. SUV - Stands for Sport Utility Vehicle. These are usually multi-passenger wagon-type rigs, not pickup trucks. Tie rod - A section of steering linkage. One thing that all tie rods have in common is that the outer end always attaches directly to the knuckle. 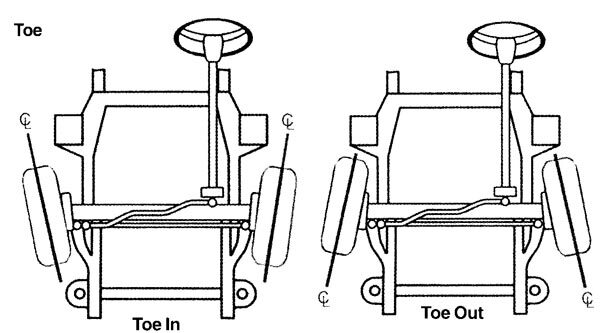 Toe angle - A steering geometry term. Toe - A bony, multi-jointed, flesh-covered appendage on your foot, normally found in sets of five. Tow - What you will eventually require if you operate an ill-prepared vehicle. Track width - The measurement from outside of tire-to-outside of tire. Track bar - Found on basically all coil spring-equipped rigs that have solid axles, and some leaf spring equipped vehicles. The bar helps locate and stabilize the axle housing. Generally, when lift exceeds 2", the bar must be relocated and / or replaced with a longer, adjustable unit. TTB - Acronym for Twin Traction Beam, Ford's Independent Front Suspension system found on most 1980 to 1996 models. Turning radius - A measurement of the distance required to turn a vehicle. Upside down and on fire - A situation to be avoided. Wheel travel - See "Suspension travel." Wrap-up - Referred to as both rear spring and rear axle wrap-up. As power is applied, torque load causes the rear pinion to pivot upward. Once this load reaches a certain point the leaf springs begin to deform, and wheel-hop is induced. The "fix" is to increase spring strength, reduce leverage by decreasing lift block height and / or install Superlift traction aid devices.